The following describes the installation and registration process for Delphi for PHP 2.0. Run install.exe to start the install launcher. 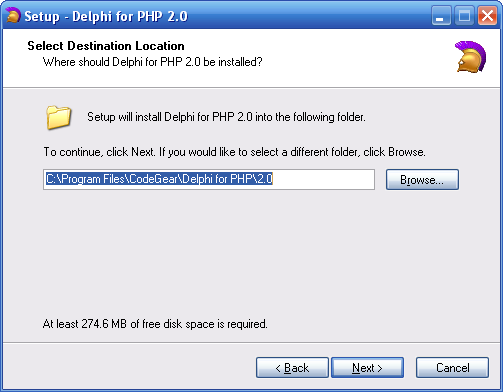 From here you can select to install Delphi for PHP, visit the Delphi for PHP web site, browse files on the CD or install directory, or view setup information. 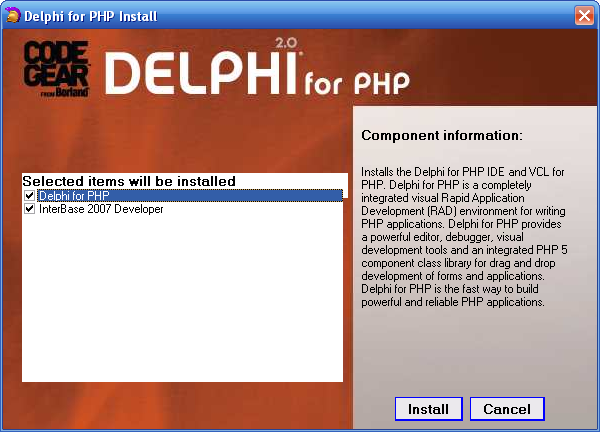 When you click “Install Delphi for PHP” you get the install options dialog. Delphi for PHP includes a bundled developer edition of CodeGear’s InterBase 2007 database. InterBase is a small footprint, easy-to-maintain database. Installing InterBase is recommended because InterBase is used in a number of the Delphi for PHP sample applications. 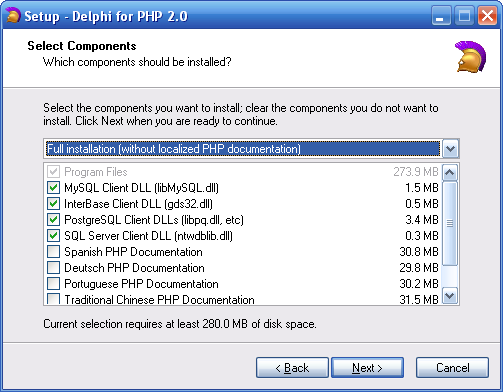 When you click Install to install Delphi for PHP, you will next see the Language Selection dialog. This choice affects the language for the installer strings. For example if you choose Spanish, you will see the remaining install dialogs in Spanish. After clicking “OK”, the Setup wizard is displayed in the language you selected. 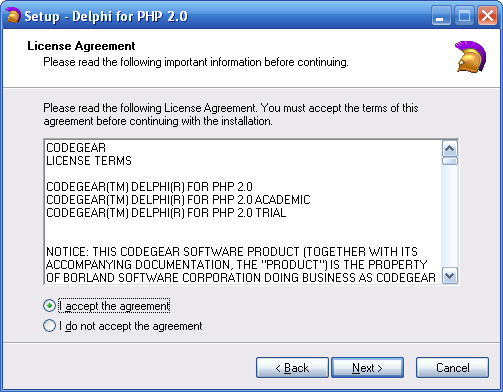 The license agreement is displayed. You must agree to the license to continue the setup process. The license is only available in English with French translations where required for areas of Canada. Choose the install directory and note the hard disk space required for the base install. Additional items that you choose on the later Select Components dialog such as localized PHP documentation will increase the hard disk space requirement. After clicking next, the Select Components dialog is displayed. Select any additional items you wish to install from this dialog. Database client library DLL files are selected by default and will install the latest supported drivers in the correct locations for Delphi for PHP. If you already have the DLLs installed or wish to use a different version, you can uncheck the boxes. Localized PHP language documentation is available in a number of languages. Check the boxes if you wish to install any other than English. Note that this is only the PHP language documentation. The documentation for the IDE and VCL for PHP are English-only. After clicking “Next”, a dialog tells you where the Start Menu shortcut will be set up. You can enter or browse to an alternate location if you wish. 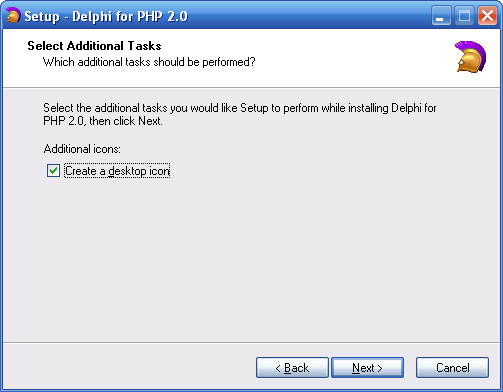 The next dialog gives you the option of putting a Delphi for PHP icon on your desktop. It’s unchecked by default. Check the box if you want a desktop icon. After clicking “Next”, review the Ready to Install dialog and verify your install settings or click back to adjust any if necessary. When you click “Install”, installation begins and install progress is shown. If you already have database client DLLs installed, you will be prompted about whether or not you would like to overwrite the files. At the end of the install process you will see the Finish Installation dialog. If you chose to also install InterBase 2007 Developer Edition on the initial launcher window, the InterBase installer will be launched after you click Finish on the dialog above. The first time you start the Delphi for PHP IDE, the registration wizard will appear. Follow the instructions in the registration wizard to register your product. 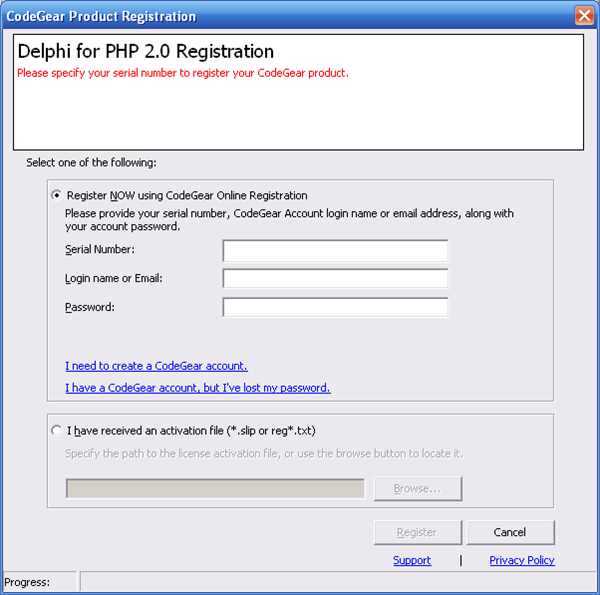 The registration wizard will also appear if you were using a trial edition of Delphi for PHP and your trial serial number has expired. You can enter a purchased serial number to reactivate the product as a non-expiring full version without re-installing. 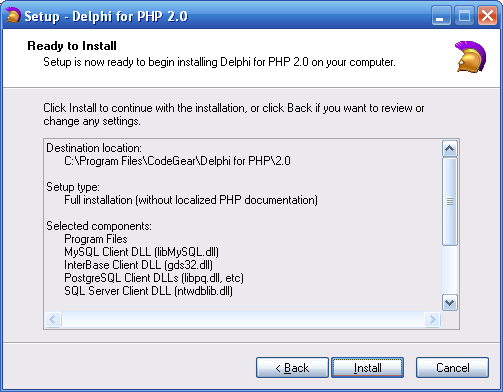 If you need further assistance installing Delphi for PHP, visit http://support.codegear.com to view the installation FAQ or open an installation or registration support case.